One of the newest and most innovative products on the market is Neolith, and T. Brothers Tile is one of the few exclusive companies in Las Vegas that offer this product for purchase and installation. 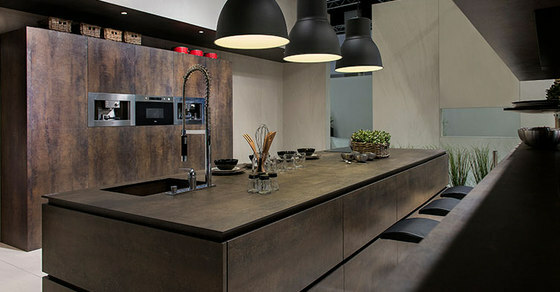 Combining style and functionality Neolith is an all natural porcelain slab product that is completely recyclable. Not only is this material environmentally friendly, Neolith is a multi purpose material that can be used for interior, exteriors, facades, and designer pieces. With the wide variety of color selections to choose from, this modern and chic material is being featured on many current and upcoming designer shows on HGTV. LIGHTWEIGHT The thickness of the ceramic sheets facilitates transportation and handling, reducing the load factor on the cladding. WATERPROOF Waterproof and resistant to liquids, with an absorption level of almost zero. EASY TO CLEAN Resistant to any kind of chemical cleaning agent such as bleach or ammonia. HYGIENIC It does not give off any harmful substances and is totally suitable for contact with food. RESISTANT TO HIGH TEMPERATURES It does not burn in contact with fire nor does it emit smoke or toxic substances when subjected to high temperatures. RESISTANT TO WEAR AND TEAR Its hard surface makes it resistant to scratches and abrasion. RESISTANT TO BENDING It has a high shear rate, making it resistant to heavy loads and pressure. EASY TO INSTALL Due to the large slab size, NEOLITH is easily cut and edge polished to the correct custom size for each application. Fixing and finishing is easy using the correct mechanical or chemical bonding materials. CAN STAND STRONG SUNLIGHT NEOLITH has high UV damage resistant properties. For more information on Neolith or any other product offered at T. Brothers Tile. Please contact a sales professional at 702-221-8453.